This page is the start page for many 3-4 point joseki. For many centuries, the 3-4 point has been the most common way to start a game. Over the ages, many joseki have appeared for approaching the lone stone. Less common are e, f, g, and h. The approaches at x and y are commonly regarded as mistakes. If Black has the next move in this corner, then Black can make a 3-4 point enclosure. For an overview of variations, see 3-4 point low approach. For more detail on a specific move, click on the letter in the diagram. m not joseki, but sometimes played by beginners; see Noseki 5. The high approach to the 3-4 point is a modern tactic, aiming to build influence. For an overview of variations, see 3-4 point high approach. For more detail on a specific move, click on the letter in the diagram. The distant approaches allow black to take the corner territory easily, but avoid the violent fighting that can result from a pincer against a closer approach. For a context where the distant approach is commonly used, see Kobayashi fuseki. For an overview of variations, see 3-4 point distant low approach. For more detail on a specific move, click on the letter in the diagram. For an overview of variations, see 3-4 point distant high approach. For more detail on a specific move, click on the letter in the diagram. Approaches a-c are sometimes used against the Chinese fuseki, see 3-4 point approach from the wrong direction. 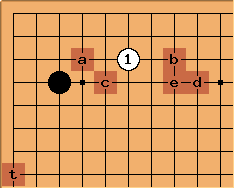 The shoulder hit at e is not considered to be joseki. Click on the letters in the diagram for more information. 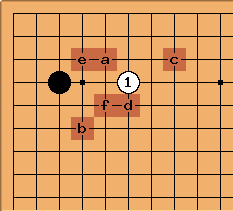 If white does not approach the corner, black will usually add a second stone to make an enclosure (but see Chinese fuseki). The most common enclosures are shown below; click on the letter for more details. 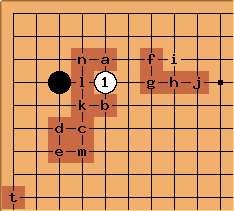 For joseki arising from these positions, see 3-4 point enclosure joseki. Source for all statistics on this page is the latest update of MasterGo, containing around 48.000 professional games until early 2009. The distance setting was invariably 4. Here only a sample from 1988 until now was used to give the modern preferences. More on the big historical changes in the next paragraph. For a long time the one space low approach was the standard play; it was played in over 90% of the cases between 1900 and 1910. When players tried new ideas in the 30s, first the distant approach became popular, in the period from 1934 to 1937 it was played in nearly each third case. Later on, this move lost in popularity gradually and is rarely played today, although Go Seigen advocated it recently. The one space high approach - today's standard move, started to gain attention in the mid-twenties and got popular slowly but steadily, and only fifty years later it became more popular than the low approach. Bob McGuigan: I'm not sure these simple statistics tell the whole story. It would be more interesting to see what happens in positions where both high and low approaches are appropriate. For example, the high approach is often more appropriate in moyo-oriented games, the low approach in territorial games. In other words, whether the high or low approach is played depends on the larger scale position, not just on the corner.